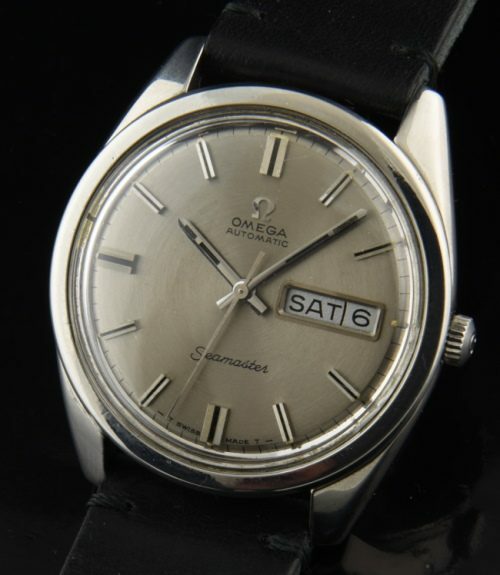 This 1969 OMEGA SEAMASTER has a very interesting ORIGINAL pewter dial that changes tone depending on the angle. This watch has a day/date feature with quick-set. The baton hands with double black inset also creates interest. The Omega crown is correct. The stainless steel looks large (36.5mm.) and has beefy lugs and sea monster screw-back. The automatic caliber 750 OMEGA movement sparkles and is accurate-just cleaned. I love this dial!